Save $15 when you order all of the Maryland Board of Massage mandatory courses as a set! 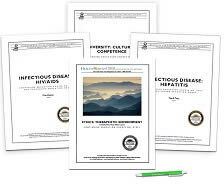 Learn about modes of transmission, infection control procedures, clinical management, and prevention of human immunodeficiency virus and acquired immune deficiency syndrome as well as its impact on testing, confidentiality of test results and treatment. This continuing education course also covers information with regard to universal precautions for healthcare workers and implications for the massage therapist. Once again this information is compiled in a logical way. It is a very good refreshment of my knowledge on HIV/AIDS facts and understanding. I will use Integrative Healthcare courses for any future requirement. I will most definitely return to review this material I have tested on throughout the year! I have been a massage therapist for 13 years which makes it difficult to find information I haven't heard before. This was probably the most comprehensive course I have taken and it also has some good NEW information.